Box8 Desi Meals is India's fastest growing on-demand online food delivery website. It started as a small outlet in a corporate cafeteria and has now grown big. It has over 50 outlets spread across Bangalore, Mumbai and Pune delivering more than 10000 orders every single day. It also gives out various discounts and deals to their customers. You can avail fabulous discounts on a wide range of food items like pizzas, sandwiches, wraps, biryanis, salads, all-in-one meals and much more. If you want to save big on your food orders then use the promo codes present on this site. Order and get flat 50% off on all orders sitewide. Valid only on First Order. Here max discount you can get is Rs 150. Minimum cart value required is Rs 300. Hurry up and avail now! Order food online and get flat 15% off on all orders across the site. Choose from the menu and make avail of this offer. Apply promo code on your checkout page and avail now! Order and get flat Rs 150 off on food online at Box8. Minimum cart value required to get this offer is Rs 298. Not valid on sides, drinks & Ice-creams. Valid only on Box8 mobile app & website. Valid only on new users. Apply coupon on your checkout page and place your orders. Order food online at Box8 and get flat 20% off. Minimum cart value required to get this offer is Rs 298. Valid only on Box8 mobile app & website. Not valid on sides, drinks & Ice-creams. Valid for both old and new users online. Maximum discount you can get here is Rs 100. Apply Box8 coupons on your checkout page and place your orders now! Order and get flat Rs 50 off on all orders site wide at Box8. Minimum order value required to get this offer is Rs 248. Offer valid for all users. Not valid on sides, drinks & ice creams.Apply coupon code on your checkout page and avail now. Hurry up and place your orders now! Order and get flat 30% off on all your online food orders at Box8. No minimum cart value required to get this discount offer. Maximum discount you can get here is Rs 100. Offer valid only on first orders. Apply coupon on your checkout page and get this discount deal. Avail now! Box8 offers flat 50% off on all online orders. Minimum cart value required to get this offer is Rs 250. This offer is applicable only for new users. Maximum discount you can get here is Rs 125. This Box8 discount offer is not valid on sides, drinks and ice creams. Apply Box8 promo code on your checkout page and place your orders now! Box8 offers Buy 1 Get 1 FREE offer on sandwiches, wraps & salads. Offer valid only on first orders. Minimum cart value required to get this offer is Rs 150. Maximum discount you get is Rs 250. Apply coupon code on your checkout page to get this exclusive offer. Avail now! 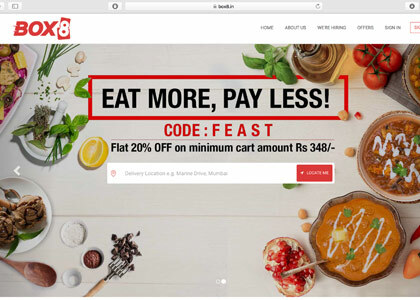 Box8 offers flat Rs 150 cashback on all food orders online. Minimum cart value required to get this cashback offer is Rs 248. Valid only on online payments for all users. This exclusive code is not valid on sides, drinks & Ice-creams. Valid only on Box8 mobile app & website. Hurry up and avail now! Box8 offers flat Rs 100 off on all orders. Minimum order value required to get this offer is Rs 398. Applicable for both old and new users. Not valid on sides, drinks & ice creams. Apply Box8 coupon on your checkout page and place your orders now! Box8 offers flat Rs 200 off on all orders across the site. Choose from various food items and apply coupon on your checkout page to get this discount offer. Minimum cart value required to get this discount offer is Rs 598. Valid for all the users. Not valid on sides, drinks & ice creams. Avail now! PhonePe offer: Order and get flat 50% cashback on all food orders online at Box8. Offer applicable only on payments done via PhonePe wallet. No minimum cart value required to get this offer. Maximum cashback you can get is Rs 75. Valid for old and new users, only twice per users. No Box8 coupon codes required to get this Box8 cashback offer. Order today. Order food online and get flat Rs 150 cashback on your orders. Applicable for all users. Minimum cart value required to get this offer is Rs 248. Hurry up and avail now! Box8 offers you fabulous discounts on wide range of pizzas, biryanis, wraps, sandwiches, salads and All-In-One meals. Order here and use this Box8 coupon first order to get flat 100% cashback on your online orders. This Box8 coupons first order is valid on a minimum order of Rs 200. This coupon is not valid on drinks, desserts, sides, rotis & rice. Order today. Get some awesome food delivered at your door steps. buy 1 get 1 free on minimum orders worth Rs 200. This coupon code is valid on pizzas, All-in-1 meals, biryanis, wraps, sandwiches, salads, staples and curries. Cashback will be credited as Box8 money in your wallet after successful delivery. Order today! Weekend special offer is here at Box8! Order your favourite food for minimum Rs 500 and get flat Rs 150 discount on all your online orders. This Box8 discount code is applicable for both old and new users online. You can order from various cities like Bangalore, Mumbai, Pune and lot more. Hurry up! Order today. Box8 brings fabulous discounts on wide range of Pizzas, Biryanis, Wraps, Sandwiches, Salads and All-In-One Meals. Order here and use this Box8 coupon first order to get Rs 150 discount on your order. This Box8 Coupons First Order is valid on a minimum order of Rs 300. This coupon is not valid on drinks, desserts, sides, rotis & rice. Order today. Now order your favourite food online at Box8. Get best price on wraps, choose from different wraps like paneer housefull wrap, chefs paneer special wrap, tandoori paneer wrap, veg tandoori mix wrap, veggie patty wraps and more at a best price starts from Rs 68 only. Order today! With Box8, Get two Veg Box for Rs 258 by applying the above coupon while placing an order. Select any Mouth watering Veg Boxes and get them to your doorstep. This coupon is not valid on Supreme category. Order today. Thanks to the rapid pace of online shopping that today ordering food online have become a child’s play, with so many brands foraying into the market. So if you have been willing to have this experience of ordering food online and if you are located anywhere in Pune, Mumbai and Bangalore then ensure that you order your food from Box8 Desi Meals. This is the fastest online food delivery website that has come into existence in the recent times and has been able to capture the pulse of the youth and is fast becoming popular. Initially, it started as a basic outlet in a corporate cafeteria and today has expanded in a huge way. Want to avail some of the amazing deals from this brand? If yes, then make the most of the Box8 promo code that is available on HappySale and save a good deal. Good food for less at your doorstep is what Box8 is all about. It clearly understands your hunger pangs and brings you hot food at right time. This unique food place gets different types of combos for you that makes your ordering process a better one. They have all-in-1-meals where you need worry about choosing what to eat as the menu will be curated by food experts. Fushion box brings you 8 layer desi meal which has so much of flavor and taste in that. Apart from these, they do serve curries, biryani, salads, paratha wraps, sandwiches, desserts, and drinks. All you need to do is download the app which is available for Android and iOS and order your favorite food. You can ever order on-site at much lesser prices with Box8 coupons that are listed on this page. With its amazing range of food menu and dedicated service, Box8 has been able to grow up to 50 outlets and more all over Pune, Mumbai, and Bangalore. This brand successfully delivers over 1000 orders each day. Even they make all your occasions really special. Order your food for parties, working lunch, team lunch, events like training, meeting, and conferences and so on. And the reason why you have to choose Box8 is for their hot, fresh and delicious food; super cool pricing, top-notch packing and speedy delivery. And since has several deals and discounts to offer to its customers, today more and more users across all age group are opting in for this brand. So when you make use of the Box8 discount code you have the chance to make the most of the sandwiches, rolls, wraps, salads, pizzas and other platters that are put on offer for a less amount. So you can order the best menu for less here. From the promotional discounts to cashback deals you have access to it all. The best Box8 offers are available on HappySale! So you don’t need to search helter-skelter online for the same and waste your time as the authentic deals are listed on this website. All you have to do is make the most of it and read the descriptions as well. Post that, you can activate the deal within the validity timeline.